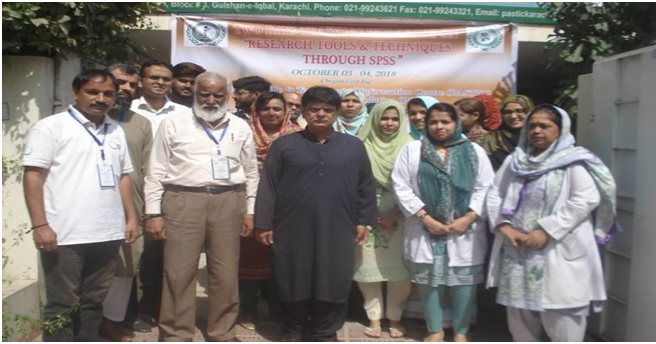 PASTIC Sub Centre Karachi arranged a two-day training Workshop on "Research Tools & Techniques through SPSS" at PASTIC Sub Centre Karachi on October 3-4, 2018. Total 17 participants attended the workshop. In the inaugural sessions Deputy Director PASTIC Sub Centre Karachi briefed the participants about PASTIC services through PASTIC website, and documentary of PASTIC / PSF was played. Resource Person was Dr. Nazeer Khan and Ms. Sara Wahab from Jinnah Sindh Medical University, Karachi. Deputy Director PASTIC distributed shields among the resource persons & certificates to the participants.